Made with hearty brown rice and healing turmeric, this satisfying rice porridge is full of flavor and nutrition. By using the Instant Pot, this normally long-cooking dish can be on the table in well under an hour. It’s also a great make-ahead dish that can be kept in the fridge and reheated on demand in the microwave. In the Instant Pot, combine the rice, salt, and tumeric, if using. Add the broth. Close the lid of the Instant Pot and set the valve to the sealing position. Cook on high pressure for 35 minutes. When the cooking time is up, quick release the pressure and serve hot with desired toppings. *Congee is usually made with a delicate white rice like basmati or jasmine, but I really like the flavor of brown rice. You can substitute white rice for all or some of the brown rice. If you use all white rice, you can reduce the cooking time by 10 minutes. **I have tried this with both ground turmeric and minced fresh turmeric and I was surprised to discover that I like the powdered version better. It delivers a lot more flavor. ***Feel free to substitute vegetable broth or water to make this congee vegetarian. 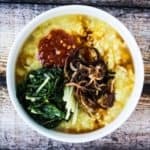 ****You can make a big batch of congee and keep it in the fridge for up to a week. It’s great to have on hand to heat up for quick meals. The rice will continue to absorb the liquid, so you’ll want to add more before heating. I usually add about ¼ cup of water to a bowl of cold congee and then pop it in the microwave for a couple of minutes.